1. Fluff wreath by bending stems up and out. 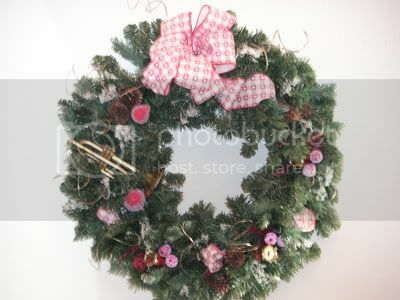 looping narrow wire in a small circle on the back of the wreath. is the easiest to fluff up and arrange nicely. 4. Arrange decorations as desired keeping in mind that the rule of thumb is an odd number of the same type of decoration such as 3, 5, 7, etc. 5. I usually place decorations on the wreath and play with it until I find what I like. Then, hot glue the items on the wreath. TIP: When placing the items in the wreath they will look better if you will place them down inside the branches, rather than just laying them on top.